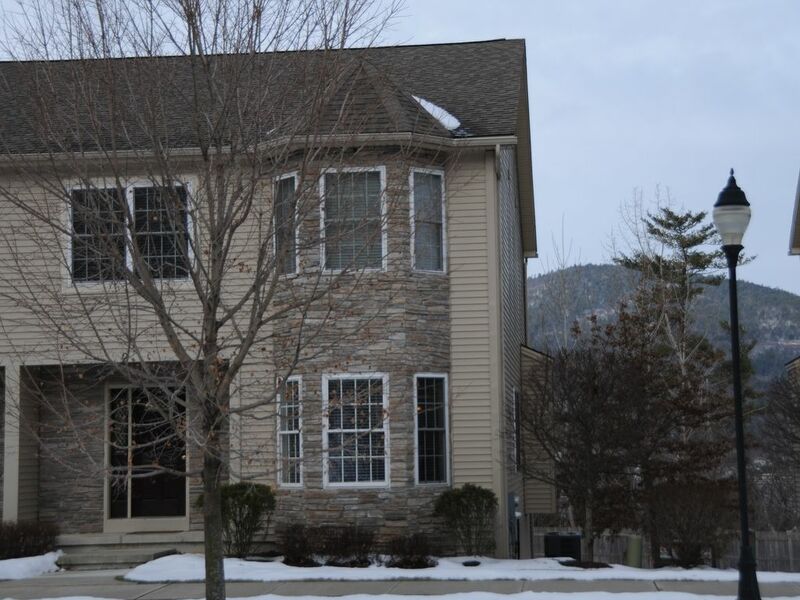 If you are looking for a private escape to enjoy all the outdoor recreation that the beautiful Adirondack Mountains and Lakes have to offer, but want the convenience of being in the heart of the historic Lake George Village, you have found your match with this large, comfortable, immaculate town house. What a location! Walk to 3 beaches, marinas, multiple restaurants and Lake George Village. This ultra-modern tri-level, centrally air-conditioned rental town house offers everything you could ever want for your home away from home. Why stay in a hotel when you can have the all the flexibility of a private house? This rental can comfortably accommodate up to 9 people at once and never seem crowded. Open floor plan, gas fireplace, custom kitchen with granite counter tops, stainless appliances, deck with patio table and gas grill ... Plenty of room for two families! This beautiful 2,400 sq. ft town house offers wonderful views of the mountains as well as a filtered view of the lake. Conveniently located so that you can walk to restaurants, beaches and to the center of Lake George Village so there is no need to worry about parking or traffic. Fully stocked gourmet kitchen and gas grill on deck provide a choice of dining in or experiencing one of the many diverse local restaurants. Wireless internet and flat-screen TVs equipped with DVD players, with a DVD library and cable TV provided. Minimum Rental Age is 25 years old. See fireworks over the lake every Thursday night in the summer. Linens for all king, queen and twin beds provided. However, we offer a reduction in price option if you'd prefer to bring your own linens. Conveniently located on top level between Master B/R, and Bedrooms 2 and 3. Ample parking in private lot as well as garage and driveway. Single car 27-foot long garage with private driveway. Store your car, boat or jet skis. We love it here. The condo is roomy and cozy. Location is perfect. The house was very clean, comfortable and in a very good condition. The owners were very friendly and hospitable. Thank you very much for your hospitality! We loved staying at this rental. We were there for 8 nights. It was clean and comfortable - just like home, with plenty of room for our large extended family. My kids were able to ride bikes, we could walk to the lake and into town (which was a little far but on the nice days it was great!) It was a pleasure working with Mike and Debbie. The only suggestion I would make is to have more kitchen utensils. Making breakfast every morning without a simple wooden spoon was a challenge, especially when cooking more than one thing. Some extra eating utensils might be helpful too when hosting a large family. Clean, comfortable and a good location! We really enjoyed our visit to Lake George and the condo was a comfortable place for our whole family. It was roomy and clean. We would definitely stay there again! Had an awesome time at Debbie & Mike’s unit was as described. Loved everything about this condo! The location is fantastic. We walked to the beach and downtown restaurants and shops. We can't wait to go back. Lake George and the surrounding area is packed with restaurants, hiking, antique stores, sailing, outlet shopping, fishing, para sailing, golf and hundreds of other activities for the whole family, including The Great Escape and Splashwater Kingdom amusement parks. Lake George is approximately 32 miles long and is nearly 2 miles wide. Much of the shoreline, particularly the eastern shore, is undeveloped. The East side is quiet, private, rural, with spectacular views of sunset over the lake. There are two great swimming beaches a short walk from the house - Million Dollar Beach and Usher Park. Fishing and Boating: Bring your own boat, or charter one locally. There is a public marina within a short walk of the house. Lake George offers activities for everyone. Water skiing, fishing, sailing, paragliding, wind surfing, and even scuba diving are all popular activities. The Lake George Steam Boat Company offers cruises on the lake. The Hudson River Rafting Co offers whitewater rafting and kayaking on the Hudson and Sacandaga Rivers from April through September. Golf: Within a 15 mile radius of Lake George there are over 15 public golf courses all of them feature amazing views of the Adirondacks. Within a 10 minute drive from the house is The Top of The World course which offers a challenging eighteen hole golf course and spectacular mountain top views of Lake George. Also nearby is the 18-hole championship Hiland Park course which was rated “4 stars” by Golf Digest magazine. Championship golfing is also available at the Sagamore which was designed by Donald Ross. Mountain Biking: There are bike Trails which start in Lake George Village, where bicycles are available for rent. The ski slopes of Gore Mountain are open for biking in the summer and early fall. Road Cycling: Multiple options are available for riding relatively flat to challenging climbs on the quiet surrounding roadways. Amusement Parks: There are a choice of amusement parks in the area including Great Escape & Splashwater Kingdom Amusement Park and Waterslide World. Dinner Theatre: The Lake George Dinner Theatre in Lake George Village. Performance six days a week from June to October. Ballet and Concerts: Saratoga Performing Arts Center (SPAC) which is the summer residence of the New York City Ballet and the Philadelphia Orchestra. SPAC also offers a full schedule of and rock and jazz groups (30 minute drive). Fireworks: Watch fireworks in the Village every Thursday in the night in July and August. West Mountain is a 10 mile drive. Dynamite Hill (beginners) is a 10 mile drive. Hickory Snow Ski Resort is 10 miles away. Gore Mountain is a 26 mile drive. Killington (Vt). is a 67 mile drive. Whiteface Mountain (Lake Placid) is 88 miles away. Check out time: 10 AM Check in time: 4 PM Cancellations/refunds are not possible unless we are able to rent the house to another party for similar fees during your reserved time period. Your security deposit will be happily refunded in 10 business days, pending house and property inspection, inventory, lease compliance and prompt departure. Minimum Age for Renters is 25 years old.